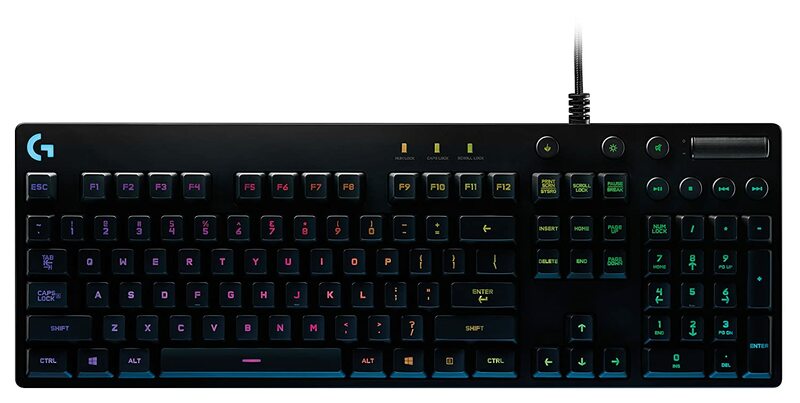 Logitech G810 Orion Spectrum RGB Mechanical Gaming Keyboard delivers a pure gaming experience. Romer-G mechanical switches deliver near-instant responsiveness. Use Logitech Gaming Software to customize RGB lighting and F1-F12 key macros. Orion Spectrum delivers a pure gaming experience. Starting with a performance-driven design, the keyboard integrates our most powerful technologies. From the finest details, like fingerprint-masking matte surface texture and braided cable, to the most advanced RGB lighting and ultra-fast, ultra durable Romer-G mechanical switches, every aspect is precisely engineered to bring Logitech G’s industry-leading technology and quality of construction to the uniquely crafted form. -Long Lasting, High Speed Technology. Logitech exclusive Romer-G™ mechanical switches deliver near-instant responsiveness, with a switch actuation point 25% shorter than standard mechanical switches, giving you the edge when every millisecond matters. Tested to 70 million keystrokes, Romer-G switches are 40% more durable than standard mechanical key switches. -Center-illuminated Full Spectrum RGB backlighting. Use Logitech Gaming Software to choose your level of customization with the ability to select and personalize each individual key light from a spectrum of over 16.8 million colours. Synchronize lighting effects with other Logitech G devices using Logitech Gaming Software. Mark keys by color to keep track of spells and other commands, or change colors to match your setup. Orion Spectrum has centrally lit keycaps and more uniform lighting coverage across each keycaps for cleaner, more readable lettering. Logitech Gaming Software comes pre-loaded with profiles for over 300 games. -Always hit the right beat. Control your background track without switching out of your game. Orion Spectrum features dedicated media controls that can be used to play, pause, and mute music and videos instantly. Use the roller to adjust the volume, or skip to the next song with the touch of a button. CUSTOMIZE WITH LOGITECH GAMING SOFTWARE. Logitech Gaming Software gives you full control of G810. Customize your favorite games with custom button macros on F1-F12. You also get full control of per-key RGB lighting and can customize which keys are turned off when you turn on game mode (by default, Game Mode disables the Windows key).